We believe that only trained qualified masseuse can offer an authentic Thai Traditional Massage! This is why all masseuse at Siam Wellness Centre are trained in Thailand at the renowned Wat Po Thai Traditional Massage School located next to the famous Wat Po Temple (also where the Reclining Buddha is located). Our signature Thai massage treatments can be offered for both individuals and couples and include Thai Traditional Massage, Thai Oil Massage, Healing Thai Massage and Thai Herbal Massage. Once your inner beauty is rekindled we also have a range of treatments to look after your body such as facial treatments, manicures, pedicures, waxing and body/cellulite scrubs. 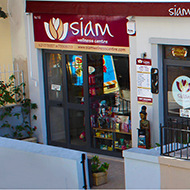 Siam Wellness has one centre located in St.Julians where we offer our full range of massage and beauty treatments. Our centre is fully setup, air-conditioned and equipped with the latest equipment and facilties and all treatments are offered by our professionally trained staff who have several years of experience in delivering only the best possible service to all our clients. Our main centre is located in the heart of St.Julian’s and is fully equipped to offer treatments for individuals and also to couples in our special rooms apart from having separate areas for beauty treatments.